Hvar is considered to be the “party central” of the Adriatic. All the popular, regularly visited nightclubs and cocktail bars are on that island. Specifically, the rich nightlife offer revolves around the city of Hvar, which is sometimes dubbed “The City That Never Sleeps”, at least during the summer season. It is the period when Hvar becomes crowded with visitors from all over the world. Various world famous persons such as Beyonce or Prince Harry can be seen in local nightclubs every season. There is no better way to finish the long and refreshing day at the beach, preferably followed by a delicious evening meal in one of Hvar's brilliant restaurants, than to spend a long and energetic night in one of Hvar's popular nightclubs welcoming the sunrise with dance and joy. The best venues to “prepare” and warm up for the night of fun and dance are Carpe Diem, Nautica, Sidro or Kiva cocktail bars. Carpe Diem is a beautifully designed, very popular venue regularly visited by numerous celebrities. You can enjoy masterfully prepared cocktails on a spacious, moon lit veranda. Kiva is a cult venue, popular among young people and artists looking for a more relaxed and somewhat quirky, but ever so positive atmosphere. After the proper warm-up, you can head towards one of the local nightclubs and enjoy the dancing rhythms until after the sun has risen. Carpe Diem Beach is another immensely popular venue. Situated at the Malinkovac Isle of the Pakleni Otoci archipelago in front of Hvar city, it is a combination of luxurious beach and swimming pool by day and a popular lounge bar by night, often visited by celebrities and world famous DJs. Veneranda club is situated within the ancient walls of the former monastery, equipped with an open air swimming pool. It often hosts famous DJs from all over the globe ensuring the best party atmosphere and hot dancing rhythms until the early morning hours. In more peaceful evenings, Veneranda serves as an open air cinema showing the most recent movie hits. A rarity in these areas is Pink Champagne, a Paris-style cabaret club in Hvar's old town. It is an upscale lounge club hosting burlesque-style shows, but also the “regular” dancing parties and concert events. And if you prefer to take it easy after the sun has set and would rather avoid the crowd for the night, visit one of the local cocktail bars in Stari Grad or Jelsa and enjoy in a more relaxed atmosphere while sipping your delicious cocktail. 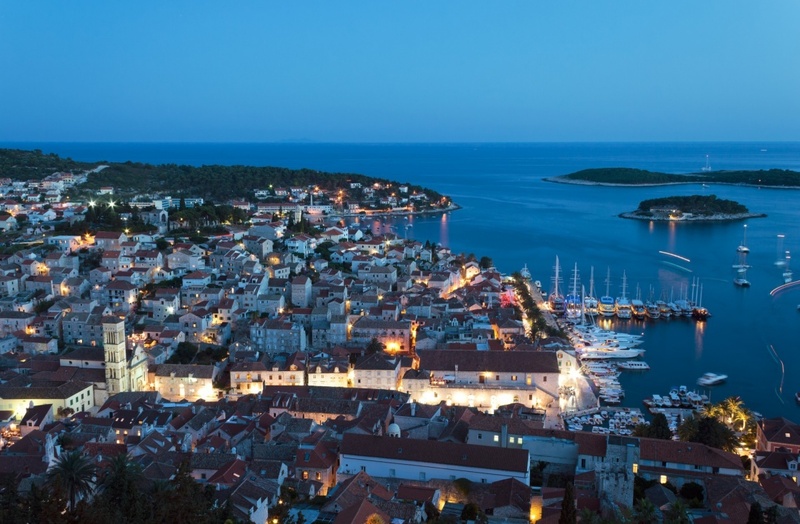 Those who are hungry for cultural events, won't be disappointed by the Island of Hvar either. Hvar Summer Festival lasts throughout the tourist season hosting numerous open air theater performances, concerts and exhibitions.